People who don’t know about the Weight Watchers plan, don’t understand that nothing is off limits when you are following the plan. But those of us who know (like you & me 😉 ), understand that as long as you track everything that passes your lips and keep within your SmartPoint allowance you should be fine! With this way of eating, there is no eliminating carbs, no cutting out sugar and no restricting fruit & vegetables. I’ve done those kinds of diets…. I don’t know about you, but I can’t live that way! I need to be able to eat all food groups. 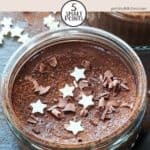 If you also like chocolate, you may be interested in this Chocolate Hummus recipe. You may also find this list of Low SmartPoint Chocolate products useful to take a look at. 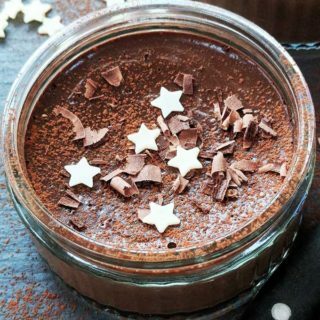 I used white chocolate stars like these, available from Amazon, to decorate these Chocolate Pots. I used small glass ramekins, like these, which are available from Amazon. This Taylor & Colledge Vanilla Bean Paste, available from Amazon, is packed full of vanilla seeds and is one of my favourite vanilla bean pastes. It is really important to temper the eggs when cooking this dish. When you add hot ingredients to eggs, you have to do it slowly. Otherwise you run the risk of cooking the eggs and in this case making chocolate flavoured scrambled egg! Not so nice. So, make sure that you add the warm chocolate milk to the eggs very slowly and whisk continually. 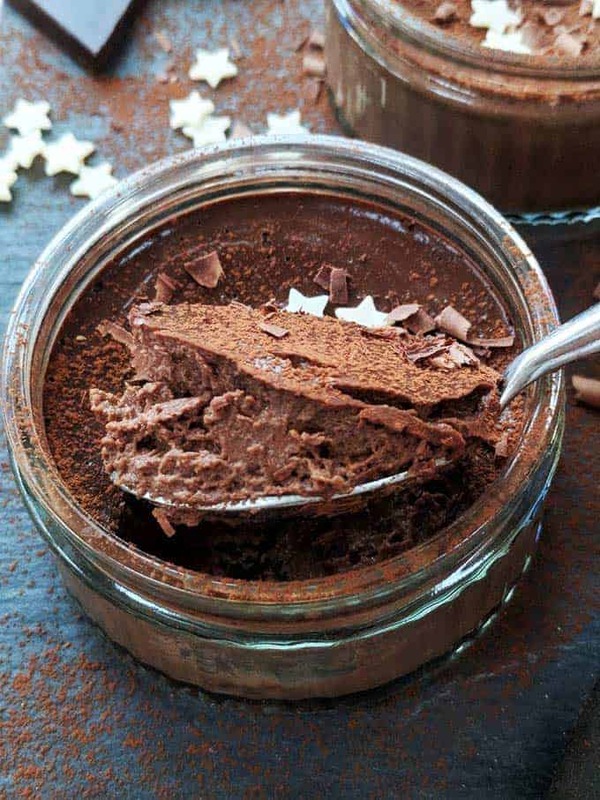 I used 71% cocoa solid chocolate to make these Chocolate Pots. This good quality chocolate meant that the desserts were very chocolatey and decadent. 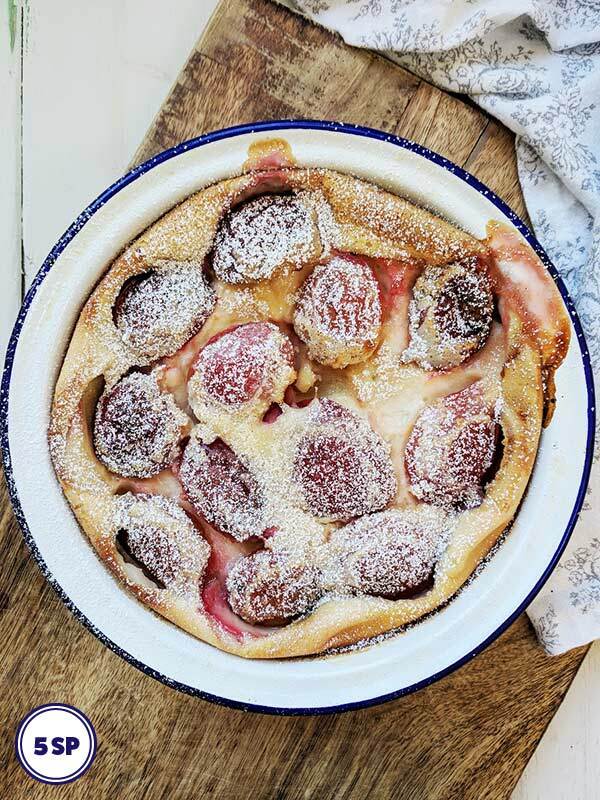 I used sweetener in this recipe to keep the SmartPoint values low. Read what Weight Watchers have to say about sweeteners here. If you don’t like the taste of sweetener (or don’t like to use it for other reasons) read below for alternatives. 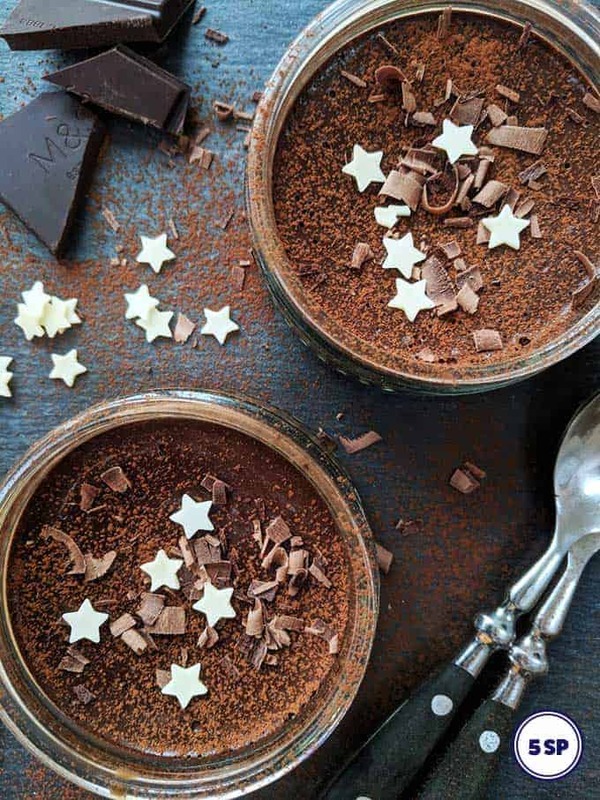 You can use a few white chocolate stars, a dusting of cocoa powder and some chocolate flakes to decorate these Chocolate Pots. Use a potato peeler or coarse grater to make chocolate curls like the ones in the picture below. Now, I have mixed feelings about artificial sweeteners! A couple of months ago, Weight Watchers re-branded as WW reflecting their move away from ‘just’ a Weight loss program towards an overall Wellness program. They also announced around this time that they would be removing all artificial sweeteners, colouring and flavouring from their food products. I’m definitely in favour of this move. I’m not so keen on using artificial sweeteners. I’d much rather use sugar or honey, maple syrup etc in my recipes! But with those ingredient you increase the SmartPoints of the recipe quite a bit! So, you can see where the problem lies! I want to be able to eat sweet treats but I also want to make and eat low SmartPoint recipes! So for this recipe I used a Stevia based sweetener. Stevia is a zero calorie sweetener, harvested from a plant and somewhere between 100 and 300 times sweeter than sugar! By using Stevia instead of sugar, I reduced the SmartPoints of this whole recipe by 7 SmartPoints. 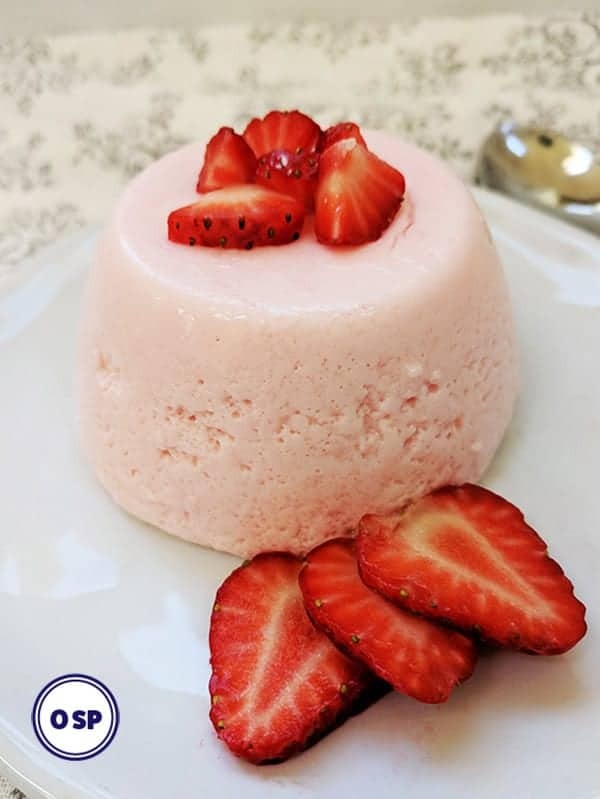 I have made this recipe using both Stevia and sugar. Using Stevia gives the Chocolate Pots a sweeter taste but it’s not to everyone’s taste. Using sugar rather than sweetener means that the Chocolate Pots aren’t quite as sweet and are 1 SmartPoint more per serving! So, it’s up to you what you do! Experiment and see what you prefer! Swap the 2 tablespoons of sweetener for 2 tablespoons of sugar for 1 extra SmartPoint per portion. 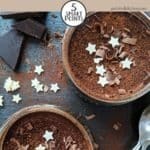 These decadent chocolate desserts are just 5 SmartPoints per portion on Weight Watchers Freestyle / Flex plan. Pour the milk into a small saucepan. Bring to a simmer and then reduce the heat. Add the chocolate and sweetener and whisk until they have melted and it is smooth. In a jug whisk the egg yolks, egg and vanilla paste till well combined. Very slowly pour the warm chocolate milk into the egg mixture beating all the time. You need to do this slowly, to temper the eggs to stop them cooking and becoming chocolate flavoured scrambled egg! Place 6 small ramekins into a roasting dish and pour in hot water till it reaches halfway up the sides of the ramekins. Divide the chocolate mixture between the 6 ramekins and carefully place the dish in the oven. Bake for 30 minutes then remove from the oven. Remove the ramekins from the water bath and place on a wire rack. Allow to cool before chilling. 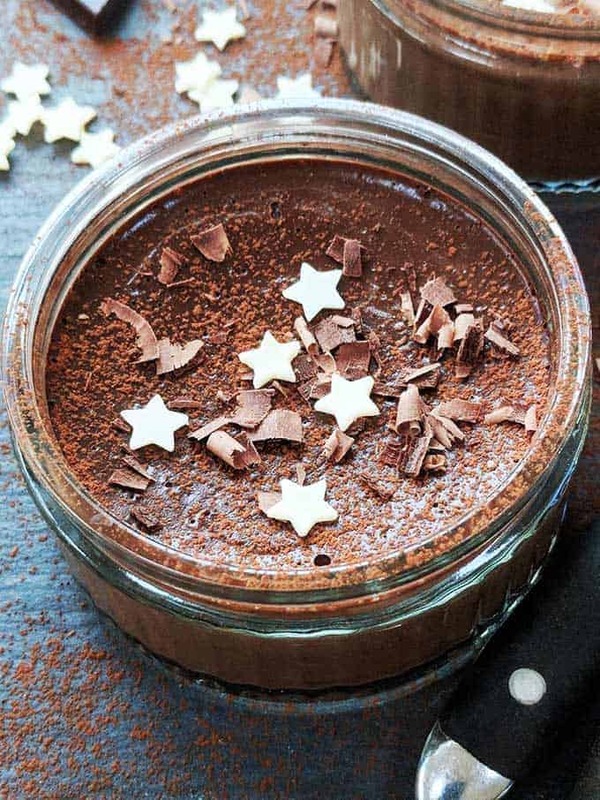 Decorate with a few flakes of dark chocolate and some white chocolate stars.